Hello! Happy weekend! Today I have a card that I made with some Taylored Expressions goodies! I started by embossing my image from Embrace Beauty with detail black embossing powder. I added color by sponging on Memento Summer Sky and Memento Cantaloupe inks. I also added distressing with Vintage Photo distress ink. My patterned papers are from the Pebbles Family Ties collection. Accessories: Taylored Dies: Banner Stacklets 1, Layering Doily Die - Small, Open Scallop Border (Taylored Expressions); Standard Circle Nestabilities (Spellbinders), Black embossing powder, Natural twine (May Arts), Foam tape, Thread, Sewing machine. So pretty Stephanie! 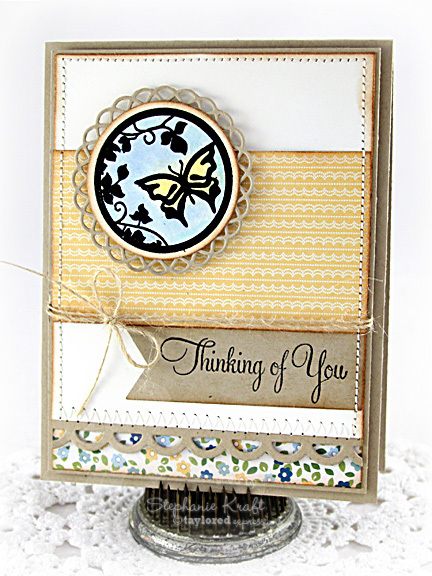 Love the beautiful butterfly and pretty patterned paper! Love this, Stephanie! That black embossing powder just pops!